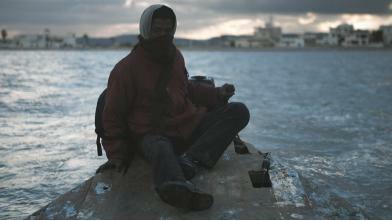 A young man (Jahwar Soudani) leaves his home in the desert, steals a boat, and makes the illegal crossing of the Mediterranean Sea to Europe, but the boat wrecks along the way. Once there, he learns invaluable lessons about himself and the natural world. Although Slim's film lacks any real dialogue, the surreal interactions between the young man (N) and the singular older man he encounters (M, Fethi Akkari) tell a surreal tale of the bonds between man and nature. "Tunisian 'The Last of Us' sole Arab film awarded at Venice festival." Tunisian 'The Last of Us' sole Arab film awarded at Venice festival - Film - Arts & Culture - Ahram Online. N.p., n.d. Web. 18 Apr. 2017. "The Last of Us." IFFR. N.p., 17 Jan. 2017. Web. 18 Apr. 2017.